EZchef Software is a powerful, intuitive and easy to use Excel 2007, 2010, 2013, 2016, 2019 or Office 365 (Windows based) restaurant software program designed to simplify your food and beverage inventory tasks, create fully costed menu items and sub recipes, and use menu engineering and analysis as a tool to maximize your bottom line profit. Customers and Distributors Have to Say…. 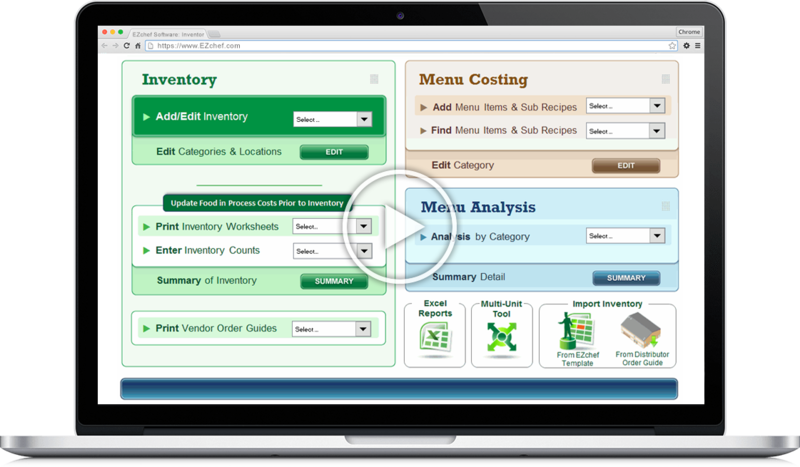 “I had been searching two years for the best way to keep track of inventory and integrate with a menu costing system. I made my own spreadsheets, tried some inexpensive web apps, and researched costly software which I couldn’t afford. I finally found EZchef. It is everything I need to operate my business efficiently and profitably. A simple program that has been nothing less than life changing, no kidding! From Vendor order sheets, inventory count sheets, recipe costing templates that are automatically updated with price change; EZchef does it all. There are indeed other options, but for the price and ease of use this is the best. “We have been using Restaurant Resource Group products for a few years now to support our franchise operations. Recently we upgraded to their latest Inventory and Menu Costing program now called EZchef. I have been using the software regularly and find it to be remarkably powerful and simple to use. The vendor import feature is effortless and reduces our workload as well as ensuring more accurate input of price and cost data. “I just wanted to touch base with you in regards to your EZchef program. I bought the program on line, and the next day I started to input all my non Sysco vendor information. I was dreading doing this, but found the transfer template feature very smooth and effortless. I must admit that I had an issue with the Sysco download as I am from Canada, and the import was not working properly. I called your help line, and spoke with you in regards to this problem. It appeared that it was a programming issue due to the differences between the Canadian and US versions of the order guide format. It initially sounded like something that would take weeks to fix, so when you called me back in less than two hours with a new “Canadian Version”, well let’s say I was blown away. I am now working hard at designing my new Menu with the help of your software. The program is so easy to use I don’t know if I will even need to use the Getting Started Guide. I even have a new manager with no food experience inputting all the information. I can only say that if you own a restaurant, and are concerned about inventory, menu costing and analysis, you would be crazy not to buy this software”. “As a new Cafe manager I was overwhelmed with the task of maintaining inventory of the countless food and beverage items required in our day-to-day operations. It’s an understatement to say I was struggling with the Café’s menu and maintaining up to date pricing. “EZchef is one amazing program! Aside from the fact that it performs all the tasks that I need in our restaurant, it is by far the easiest software I have ever seen. I used another “industry leading” program for many years and it was so cumbersome and complicated that I was the only one in the restaurant who could touch it. EZchef is so straight ahead that I was flying after a few minutes. The Sysco import is amazing and takes just a few seconds to load. This keeps all my inventory and menu costs accurate and up to date! “I have been both a user and developer of Excel spreadsheet programs for over 30 years. I worked for the restaurant divisions of PepsiCo for 20 of those years, and wrote Taco Bell’s first “Ideal Food Cost” program in 1985 (which was subsequently rolled out to 3000 restaurants). It is therefore with great pleasure that I have this opportunity to recommend EZchef, a program which I recently began to use to develop my hospitality businesses.